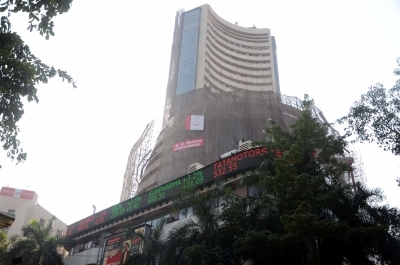 Mumbai, Feb 13 (IANS) Key indices Sensex and Nifty succumbed to the final-hour selling pressure after trading in the green for the better part of Wednesday's session on account of easing inflation giving way to expectations of further rate cut. IT stocks logged strong gained, while heavy selling in the auto, and oil and gas stocks dragged the markets into the red. "Despite cooling of CPI inflation in January to 2.05 per cent and a pick-up in Industrial Production in December 2018 by 2.4 per cent failed to create positive momentum in the market," said Vinod Nair, Head of Research, Geojit Financial Services. "Given the mixed Q3 results, market is factoring further earning downgrades, leading to outflows from FIIs and DIIs..."
The BSE Sensex closed 120 points down at 36,034.11 from its previous close of 36,153.62, while the Nifty settled down 37.75 points or 0.35 per cent at 10,793.65. Tata Motors gained the most on Sensex, up 2.18 per cent followed by HDFC, HCL Tech, Infosys and ITC. Among the top losers were ONGC, State Bank of India, Power Grid, Larsen & Toubro and Yes Bank.